The Union Cabinet yesterday approved the urgent legislation announced by Muthalak convicted. The Muttalak legislation is pending in the Rajya Sabha. The Central Government has brought this legislation to this effect. 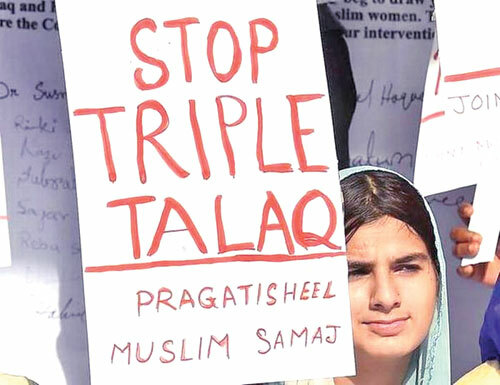 Last year, the Supreme Court ruled that Muslim men had been arrested three times for divorce. In exchange for this practice, the Central Government has been advised to pass a new law. Accordingly, the 28th Muttalak Bill was passed in the Lok Sabha. Opposition parties, including Congress, have been strongly opposed to the bill and said that the bill was urgent. However, the bill was passed on the same day as the BJP has a majority in the Lok Sabha. This law was meant to imprison a maximum of three years for Muslim men who followed the Muttalak practice. However, in the Rajya Sabha, the BJP did not have a majority due to lack of majority. Meanwhile, the Central Government came forward to make some amendments to the bill. Accordingly, Muttalak is a legal offense and will continue for 3 years imprisonment and fine. This is the type of bailout. After investigating with the victim's wife, the magistrate will decide to bail the culprit. Both couples want to compromise couples have a chance to compromise. Later the Amendment Bill was passed in Lok Sabha. However, not in the Rajya Sabha. The bill was postponed to the next series. The legislation has been issued as an alternative provision until the bill is passed.